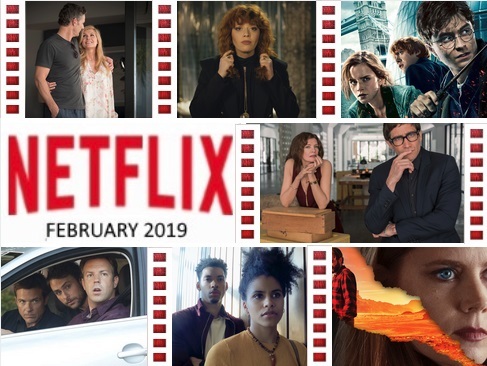 Whether you’re single or in a relationship, celebrating Valentine’s Day or Galentine’s Day, or simply looking forward to Family Day, Netflix has a mix of several exciting new originals and classics for all. Since Mother Nature doesn’t seem to be showing us mercy anytime soon, why don’t we throw a pajama party and binge-watch some shows. 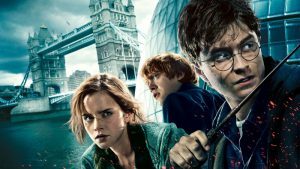 A PSA to all muggles: Harry Potter fans can fly back into the magical world of wizards and spells as the final four HP films start streaming next month (bring on the butterbeer! ), while ’80s movie lovers can binge on the Back to the Future trilogy and watch E.T. the Extra-Terrestrial. Two words: Jake Gyllenhaal. Have I got your attention? Jake’s turn in Nightcrawler is one of his best to date. So it’s no surprise that re-teaming with writer/director Dan Gilroy makes Velvet Buzzsaw (Feb. 1) a highly anticipated film. In the new satirical thriller, Jake plays a Los Angeles-based art critic who stumbles on the paintings of a recently-deceased unknown artist. But a supernatural force is at play, and the body count keeps growing. The new series Russian Doll (Feb. 1) follows a young woman named Nadia (Natasha Lyonne) who gets caught in a mysterious loop, repeatedly attending the same party and dying at the end of the night, and waking up unharmed to relive the same day over again. This comedy is created by Lyonne, Amy Poehler and Leslye Headland, so expect an entertaining ride. A new series for supernatural fans is the TV show Always a Witch (Siempre bruja – Feb. 1). It follows 18-year-old Carmen, a Colombian slave and witch from the 17th century who, in a desperate attempt to save the man she loves, travels in time to present day Cartagena to defeat a rival. If only we mere mortals could go back in time to fight for our bae. A very fitting series to hit us this month is Dating Around (Feb. 14). Each episode will follow one single who goes on five first dates. We get to be a fly on the wall err… table as we listen to the flirty banter, awkward exchanges and moments of true connection. Will there even be a second date? Netflix’s first original dating show will show the world just how many hoops you need to jump through in this dating day and age. If dating sounded fun from the previous show, well then Dirty John (Feb. 14) is for you. Get your mind out of the gutter. This first season tells the story of how a beautiful and successful woman falls for a man she met on the internet — the charismatic John Meehan. But is he who he appears to be? Did you get the chills yet? Well, here’s more: this is based on a true story. Another new series for fans of supernatural shows is The Umbrella Academy (Feb. 15). The series follows six young adults who are reunited by their father’s death and are quite shocked by the family secrets they uncover. It doesn’t end there. The estranged siblings have extraordinary powers, which they must use in their fight to save humanity. How’s that for some dysfunctional family drama? The saga of Clary Fray continues as Shadowhunters: The Mortal Instruments: Season 3B (Feb. 26) returns next month for the finale. Her adventures with angels, demons, vampires and werewolves wraps up in a surprising, thrilling series conclusion. One of my favorites, Horrible Bosses (Feb. 1), is finally streaming on Netflix. This film will have you LOL-ing in no time. Jason Bateman, Charlie Day and Jason Sudeikis are three friends who are having a terrible time with their intolerable bosses and decide to grind them into dust. P.S. Do not follow in their footsteps, but enjoy watching their foolproof plan fall into out of place. Another comedy streaming next month is Leap Year (Feb. 1). When Anna (Amy Adams)’s fiancé Jeremy (Adam Scott) doesn’t propose on their four-year anniversary, she decides to invest in an Irish tradition that allows women to propose to men on February 29th. She follows Jeremy to Dublin and enlists the help of handsome and surly Declan (Matthew Goode), who thinks what she is doing is ridiculous. Some of your favorite ’80s films are back for binging on February 1 — Back to the Future, Back to the Future Part II and Back to the Future Part III. If that’s not enough, how about a good ol’ dose of E.T. the Extra-Terrestrial? Nocturnal Animals (Feb. 1) follows Susan (Amy Adams), an unhappy art gallery owner in a crumbling marriage who receives a package from her ex-husband Tony (Jake Gyllenhaal). He leaves her a manuscript, which forces her to confront her past and some dark truths about herself. Ben Affleck directs and stars in the crime thriller The Town (Feb. 15). It was named one of the top 10 films of 2010 by the National Board of Review and earned Jeremy Renner an Academy Award nomination for Best Supporting Actor. So this one is definitely on our list to watch this February. We saved the best for last. Calling all Gryffindors, Slytherins, Ravenclaws and Hufflepuffs. Netflix has blessed us with the final four Harry Potter films for binging. Harry Potter and the Order of the Phoenix, Harry Potter and the Half-Blood Prince, Harry Potter and the Deathly Hallows: Part 1 and Harry Potter and the Deathly Hallows: Part 2. Get the Ron to your Hermione or the Harry to your Ginny and fly back to Hogwarts. I know I will. Here’s everything coming to Netflix in the month of February.